This easy patchwork table runner pattern is a quilting project made with four simple 10-inch square quilt blocks that are placed on point and surrounded by setting triangles. Borders are repeats of two fabrics used in the quilt blocks. Sew a the table runner to suit any theme by choosing different fabrics. 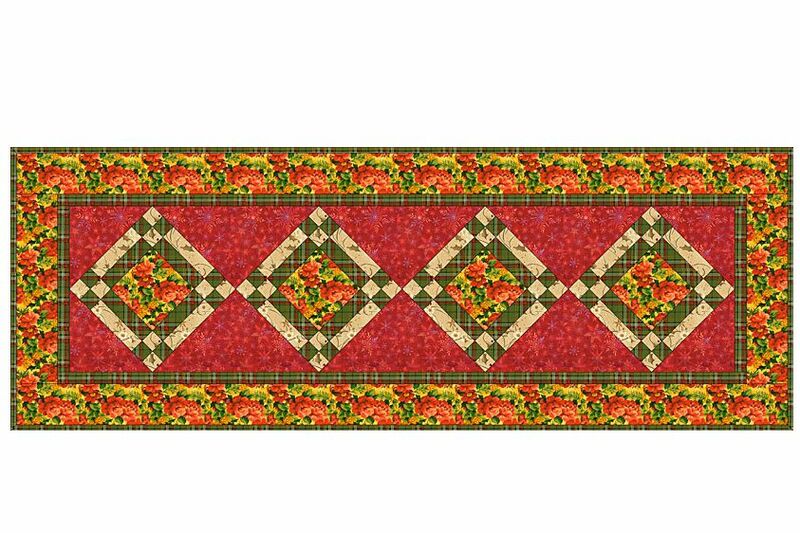 Make the table runner wider or longer by adding additional borders. To increase width without altering the length, sew an additional border across the table runner's top and bottom before adding the outer side borders, either next to the narrow border or at the edges of the runner. A border print would work nicely in that position. Use a 1/4 inch seam allowance throughout. The term selvage to selvage refers to fabric cut from selvage to selvage—do not trim strips if your fabric is wider. Sew the longest green strip lengthwise to the longest neutral strip. Press the seam allowance towards the green strip. Sew the remaining strips together lengthwise and press the seam allowance towards the green. Square up one end of each strip set. Cut a total of (32) 1 3/4 inch segments from the sets, checking periodically to make sure the leading edges are square. Sew two segments together as shown, with unlike fabrics across from each other. Press allowance either direction or fan out the seams to reduce bulk. Make a total of (16) four-patch units. Sew a long green strip lengthwise to a light neutral strip of the same length. Press the seam allowances towards the green. Repeat with other green and neutral strips of matching lengths. Square up one end of each strip and cut a total of (16) 5 1/2 inch long segments. Cut four 5 1/2 x 5 1/2 inch squares of bright floral for block centers. Arrange four four-patch units, four strip-pieced bar units, and one block center into three rows as shown. Sew the components of each row together. Press seam allowances towards the pieced bars. Join the rows to complete the block. Press. The block should measure 10 1/2 inch square. Make three more quilt blocks. Corner triangles: cut two 8 x 8-inch squares and then cut each square in half once diagonally. Referring to the illustration, sew larger setting triangles to the blocks as shown (center blocks have two each, end blocks have one each). Press seam allowances towards the triangles. Sew the block/triangle sections together along the diagonal, butting adjacent seams for a snug match. Use straight pins to keep fabrics from shifting. Center and sew a corner triangle to each outer edge of corner blocks. Press. Make straight borders to sew two borders to the quilt. If you are a new quilter, don't be tempted to measure the outer edges of your quilt for border lengths, because the table runner may be skewed. Use 1 3/4 inch strips of green plaid for the inner border. Use 3 1/2 inch strips of bright floral for the outer border. Mark for quilting if necessary. Sandwich with backing and (optional) batting. Baste the layers.